Building loudspeakers can be as casual or complicated as you want to make it. For instance, sometime in the 1960s, my dad, a skilled woodworker who had no knowledge of acoustics, built a pair of speakers that I used well into my teens. They were nothing special -- a pair of birch cabinets with mythical "full-range" drivers. On the other end of the scale is the Wilson Audio Alexandria X-2, the largest and most expensive speaker I've ever written about, and a standard-bearer in terms of present-day speaker design. In between the two are countless other speakers, some of which aim at the market segment occupied by the Alexandrias but are closer performance-wise to the speakers my dad built. This underscores the fundamental ease of building a box that will produce sound and the challenge of building a speaker like the Alexandria, which aims at redefining the boundaries of musical reproduction, a task that's involved. How involved? 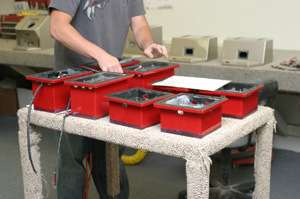 Wilson Audio's orderly manufacturing facility is a testament to speaker-building efficiency. Yet, it takes the company six weeks to make a pair of Alexandria X-2s -- 42 days from the time the raw materials come in the door until a pair of speakers leaves. Why is such a protracted period of time required for Alexandrias? This is the question I drove to Provo, Utah, where Wilson Audio is headquartered, to answer. Telephone conversations and marketing literature can tell only so much; one has to be in situ in order to get a full sense of how the massive, $135,000 USD X-2s are wrought, a process that in most ways doesn't resemble how other speakers are manufactured. The production cycles of all Wilson Audio speakers are long -- weeks in all cases -- but by their nature Alexandrias tax Wilson Audio's mechanized and human resources in ways that the company's other speakers do not. Alexandrias are an event, and one that's only fully appreciated by knowing something about the R&D and manufacturing processes behind them. What is a Feature Review? We at SoundStage! are approaching 1000 equipment reviews published during our nearly ten years in existence. In our early days, we sometimes published purely informational "sneak peeks" for products that warranted extra coverage. In order to standardize our review process, we abandoned these a number of years ago, but we still encounter products whose back story makes them difficult to discuss in detail in a 3000-word review. For these we will begin publishing multi-part Feature Reviews, which will give our writers the ability to branch out from our standard format and talk about a product in greater depth. We will reserve Feature Reviews for products like the Wilson Audio Alexandria X-2, a big speaker with a big story, and other products with long and storied histories that lend themselves to expanded coverage. We will include more pictures in our Feature Reviews, as they aid in revealing the intricacies of products. We'll remove the Review Summary box, as condensing coverage that's more extensive is counterproductive. We have several more Feature Reviews in the planning or writing stages, with the next one, on Verity Audio's new Parsifal Ovation speakers, coming soon. I met up with Doug Schneider in Provo, and together we toured the Wilson Audio facilities -- I've done this in the past -- asked questions as we saw fit, and listened to a fair amount of music. The goal was to see Alexandria X-2s during manufacture; luckily, there were pairs of the speakers throughout the factory in various stages of being. But before we saw any raw drivers or cabinet materials, we listened to a pair of demonstrations that proved the importance that Wilson Audio puts on the materials from which its cabinets are made, the well-known but mysteriously named X and M materials. First, we heard a pair of WATTs that were identical in every way except for their cabinet materials. One was made from Wilson Audio's M material, which is used in all of the company's speakers, generally wherever there is a midrange driver. The other used a heavier-than-standard-grade MDF. Drivers and crossover components were matched, but the sound emanating from each speaker was not. The differences were in no way subtle, with the MDF WATT sounding somewhat blunt, especially in the treble, which didn't have nearly the same shimmer and airiness as that of the M-material WATT. The M-material WATT was clearly better -- more detailed and lively in ways that mattered to the music. We reviewers are not used to listening for the sonic characteristics of different materials, so this demo was one that I won't forget, especially as I listen to speakers whose cabinets are made of MDF. It was a good way to begin a day of discovery. Next, at the other end of the same room, were a pair of X-1 Grand SLAMMs, Wilson Audio's top-of-the-line integrated offering prior to the Alexandrias and a speaker that has been discontinued from production. However, there are over 500 pairs of X-1s all over the world, and Wilson Audio plans to support customers who bought the speakers. A Level 5 update that incorporates some of the advancements inherent in the X-2 is now available, and one of the Grand SLAMMs we were looking at had the update. Again, we listened to both speakers, and it was obvious that one, the Level 5 X-1, was superior, although in this case the differences were even more profound than with the two WATTs. The updated X-1 sounded smoother and had greater presence. It sounded to my ears like the MAXX 2s that I reviewed last year and have been listening to since. The Level 5 update for the X-1 involves swapping the speakers' upper driver modules (which use a different combination of materials), crossover modules, and resistors, and it can be done in the field. The cost is $25,000-$30,000 depending on the age and series of the speakers. ...which looks like this after it's clamped and its adhesive begins to cure. 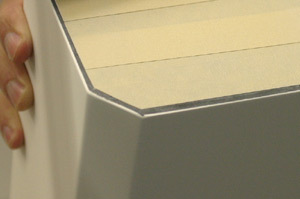 The thickness of the gel coat applied to each Wilson Audio speaker cabinet. The dark substrate is X material. 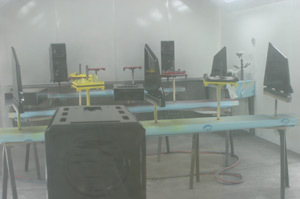 Outside looking in on one of Wilson Audio's two paint booths. The woofer module and "wing array" for one of the review Alexandrias. The potted crossover modules for the review pair of Alexandrias. In the background you can see the midrange and tweeter modules. These two demos made us believers in the importance of cabinet materials to the sonic outcome of a loudspeaker and the technology Wilson Audio has developed for the Alexandria X-2. But before we would see speakers being made, we were presented with data that backed up what we had just heard. In Wilson Audio's conference room were arrayed blocks of various materials, a small stainless-steel hammer, and a short stack of printed graphs. Wilson Audio has tested over 100 potential cabinet materials, taking measurements of each. The goal, as David Wilson and staff have come to define it, is to find materials with particular resonant-frequency behavior, something they've done with both M and X materials. The graphs we were shown, and the differences in the materials we could hear once they were struck with the hammer, proved at the very least that no grade of MDF is like the materials that Wilson Audio uses. In fact, Wilson Audio is the largest user of M and X materials, and has worked with the supplier to improve both. 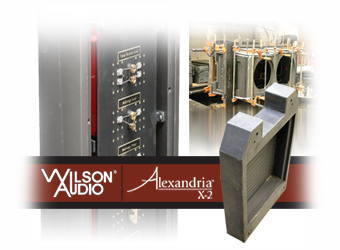 In the X-2, Wilson Audio uses slabs of X material that are up to 4" thick, each used strategically depending on its function in the overall design. The X-2's cabinet is also inlaid with lead ingots to achieve a certain resonant frequency. You have to see, feel and especially lift X material to appreciate it. Even a relatively small piece, like the chunk from which the X-2's base is carved, is very heavy (the base, shown right, weighs 60 pounds after milling). X material is so hard that Wilson Audio doesn't have to put inserts into the base for spikes, even for such a heavy speaker. They simply drill and tap holes, as X material is stronger than steel. Before Wilson Audio's expensive new Komo CNC router came online, simply cutting out the various panels for a pair of X-2 cabinets was 24 hours of non-stop work for the company's existing CNC. Even now, it still takes several hours, as the router has to take short passes in order to carve away X material without breaking bits or cutting heads. 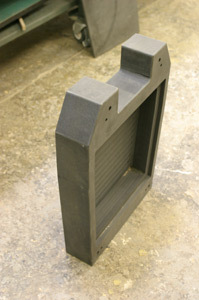 The CNC works in a slow and methodical manner; milling X material requires it. Watching the cutting head glide over the slab of dark-gray X material makes one realize that if such a machine didn't exist, Wilson Audio speakers would be so difficult to manufacture that they would likely cost multiples of their present prices. Cabinet construction is precise work. Each piece is carved to strict tolerances and fits tightly to the others. The adhesive Wilson Audio uses is as special as the cabinet materials and results in a bond that is stronger than the materials themselves. Together the materials and adhesive ensure that the cabinets are not affected by humidity -- or a lack thereof. One full week of manufacturing time is allotted to allowing the adhesive to cure properly. 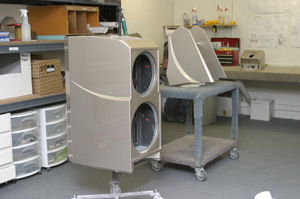 Wilson Audio is the only speaker maker I know of that sprays a marine-grade gel coat on the exterior of its raw cabinets. This performs two main functions: It completely seals the cabinet and hides all seams, and it provides the surface to which the paint adheres. The gel coat is meticulously sanded and smoothed -- it's dusty work that requires patience and an innate sense of how much pressure to apply. Cabinets as massive and complex as those for the X-2, which have six different major elements and a large combined surface area, take painstaking hours to sand. Wilson Audio's 12-step finish process requires another seven days of curing, creating a bottleneck in the manufacturing process that is only solved by having more paint booths. Wilson Audio could flash cure the finish of its speakers and thereby cut down on the time required dramatically, but this would lead to a finish with inherent imperfections. 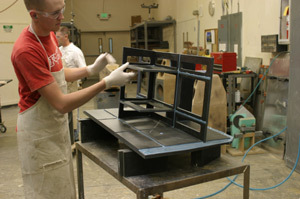 After the paint is cured, each cabinet is polished to a better-than-automotive-grade high-gloss shine. This includes removing the orange peel that so much glossy finish exhibits. For some inexplicable reason, the finish of Wilson Audio speakers is the source of contempt for some audiophiles. I don't get it. Would anyone prefer a WATT/Puppy in, say, a flat, textured black paint to a high-gloss diamond black? All that I've described so far touches only on the X-2's cabinet; simultaneously, the speakers' drivers are disassembled, modified, and reassembled. Much of this work is hidden by the cabinet, but for the X-2, the new dust caps for both woofers can be seen. Crossovers are a subject about which Wilson Audio remains secretive, but I was able to find out a few things that I didn't know. The tolerance for the crossovers themselves is tighter than that for the capacitors used, so each crossover must be trimmed by hand. Once finished, each looks like it has sprouted appendages because of all the trimming caps added. Components are point-to-point wired, which is uncommon. You'd be surprised at the shabby circuit boards and components used for the crossovers of some very pricey speakers. 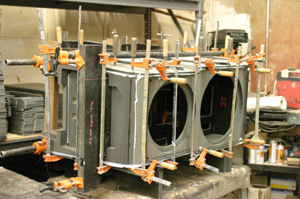 All X-2 crossover components are submerged in epoxy and housed in their own X-material cases, which are gel-coated, painted and cured in the same way as the speaker cabinets. Even the leads from the crossover modules get special treatment, as all are custom wound and terminated. OK, let's say that you have all of the elements of a pair of X-2s in front of you -- all of the finished cabinet pieces, the drivers, and the crossover modules. How long will it take to assemble both speakers? At Wilson Audio, it takes a team of three people three days to turn the parts into finished Alexandrias, something that's done for every speaker, as that's how each is tested. 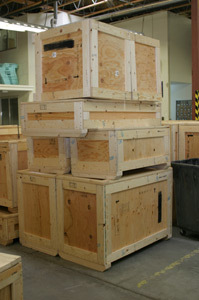 Then they're partially disassembled and crated for shipment -- seven crates and 2000 net pounds. I'll discuss dealing with a ton of loudspeaker on my doorstep in the next part of this review. After touring the Wilson Audio manufacturing facilities, Doug and I visited the demo room at David and Sheryl Lee Wilson's home in Provo. I've been there for various speaker demos in the past, including one featuring the Alexandrias. However, at that time, the speakers in residence were production prototypes that have subsequently been destroyed. On this visit, a brand-new pair was set up in the Wilsons' 30' x 40' listening room and were used with a VTL TL-7.5 Reference preamp, VTL Siegfried mono amplifiers, and an Audio Research CD3 Mk II as source. I could say something about what I heard, but as I write this, I've been living with Alexandrias for over a month, so I'll reserve judgment until I discuss the speakers in my room. I will say that what I heard once again convinced me that the Wilsons' listening room is the best environment I've encountered in which to hear reproduced music. It's wonderful for live music as well. The Wilsons also have a home-theater system in a separate purpose-built room, and we were able to experience part of the movie Master and Commander there. "Experience" is the correct term, as this was by an enormous margin the most thrilling home-theater demo I've ever witnessed. First, the picture, from the Wilsons' Sony Qualia projector, was exceptional, though not up to the standards of a good movie theater. But the sound, with MAXX 2s in front, Sophias in back, Parasound electronics, and a Sony ES DVD player as the source, had dynamic range that would have seemed impossible from a movie soundtrack if I hadn't heard it for myself. There was ample loudness, even during low-level passages, but none of the leanness or harshness at high levels that so many theater sound systems exhibit. Also in use was one of Wilson Audio's massive an XS subwoofers, which lent unmatched physical power to the sound of cannonballs ripping through a ship's deck. This is the home theater that I most covet -- perhaps the only home theater I covet -- and it would make for an unforgettable demo at CES or CEDIA. In the second part of my review of the Alexandria X-2s I will describe what's involved with setting up a pair of these speakers and also discuss a few preconceptions that audiophiles have about Wilson Audio's "sound," which I admit to having myself at one point. I've come a long way since listening to my dad's homebrew "full-range" speakers. Price: $135,000 USD per pair.